1. Make sure you're in decent shape, with a solid base to support the stress of speed training. 2. Find group workouts with runners of your ability for "speed support" and camaraderie. Check with running and triathlon clubs, schools and coaches in your area. 3. Look for a coach who's flexible and easygoing and can give you some personal attention. Some coaches work for free; others charge a fee. 4. 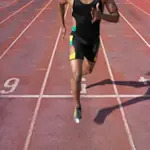 Try to do speedwork once a week, at least once every two weeks. 5. Always do a warmup and cooldown consisting of at least 10 minutes of jogging and some stretching. 6. Wearing racing shoes instead of your daily training shoes can put you in a fast-effort frame of mind. 7. Track etiquette requires that slower runners give up the inside lane(s) to faster runners. 8. With a group, run single file or two abreast but never farther out than the second lane. 9. Start with modest efforts and try to run just a little faster each week. 10. You should feel like you're running in control, at about 80 percent of maximum effort. You can judge this by instinct, or check your pulse or wear a heart monitor to gauge exertion. 11. Always leave something on the track; you shouldn't finish a workout feeling as though you can't run another step. 12. Expect three or four workouts before you start to feel comfortable. 13. Expect six to 10 workouts before your training progress improves your race performances. 14. For the best results, make a long-term commitment; speedwork is not a quick-fix solution to a running rut. 15. Vary your workouts so you don't get fixed on always comparing your times with past efforts. 16. Train lightly the day before and the day after a speed workout.